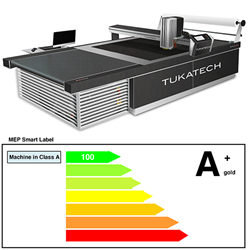 Fashion industry technology leader, Tukatech, launches clean air filtration and low energy consumption TUKAcut fabric cutting systems. First installation reduces cutting room staff from 90 people to 14 people and increases cutting room productivity by 30%. Our expectations for the TUKAcut system were exceeded by far. TUKAcut machines for lingerie, denim and universal fabric cutting are available in custom widths and heights. These machines are designed to give the ultimate performance at the lowest running cost. Though cutting productivity is at least 20% higher than other models on the market, the energy cost is 50% to 70% lower, which is a great benefit for users in countries where energy cost is a major consideration. Implementation included training personnel for raw material handling, spreading, cutting and bundling. On the first day of installation, 14 people were able to cut the same number of units (50,000) and within weeks the same configuration increased productivity to between 65,000 and 75,000 units per day. Ram Sareen, founder of Tukatech, explains that he chose to partner with Italian fabric cutting machine manufacturer, F.K. Group, to build the TUKAcut systems. Tukatech was the first partner of F.K. Group to take F.K. cutting machines out of Italy in 1995. Many of the machines installed in the US, Mexico, Canada, and India at that time are still running and producing high quality cuts. According to Sareen, the partnership with F.K. Group allows Tukatech to offer garment manufacturers reliable fabric cutting machines at competitive prices. “Similar to engineering companies like AMG partnering with Daimler-Benz to offer an amazingly high-performance vehicle to drivers who appreciate the engineering, we offer just the same with our partnership with F.K. Group,” comments Ram Sareen.